Authors: Wei Zheng, Marc Postman, Adi Zitrin, John Moustakas et al. Our ability to comprehend the cosmos is fully dependent on our limited senses. For example, humankind’s understanding of the Universe was revolutionized when Galileo turned his telescope to the skies in 1608. The lenses in that first telescope, though crude, magnified light enough to reveal that Jupiter had moons orbiting it, that the Moon had mountains and craters, and that Venus exhibited phases (and thus the Earth couldn’t be the center of the solar system). In the last 400 years, we’ve come a very long way: we now think we have a rough sketch of how the entire Universe evolved! But, the details are still somewhat fuzzy, particularly concerning the Epoch of Reionization, that early period in time when the first stars were born and the first galaxies formed. As has been discussed several times here on Astrobites, astronomers think that reionization occured some time between redshifts 10 to 6 (i.e. when the Universe was between a few hundred million years and one billion years old). However, there have been no confirmed detections of objects beyond z~9. Directly detecting a galaxy at such large distances would be a truly heroic observational feat; not only does the flux of a galaxy fall off as the inverse of the distance squared, but the expansion of the Universe dilutes the light even further. This is beyond the sensitivity of even the mighty Hubble Space Telescope. However, like Galileo, the authors of today’s paper, which has been submitted to Nature, employed an innovative technique to extend their vision: Zheng et al. also used a lens – although in this case it was a gravitational lens – to find a candidate galaxy that they show is likely to be at redshift 9.6. Furthermore, they also claim that their observations are consistent with a galaxy that formed at a redshift of z~14, when the Universe was only about 300 million years old! Gravitational lensing – the magnification of a distant background source by a large concentration of mass along the line of sight – was first predicted by Einstein’s theory of General Relativity. This technique is now commonly employed in many areas of astronomy, and has been used to find planets (via microlensing), to measure the distribution of dark matter in the Universe, and to study distant objects that would otherwise be too faint to detect, as is done in this paper. The lensing cluster in this case is MACS1149, and it magnifies the background galaxy (lovingly dubbed MACS1149-JD1) by about a factor of 15, allowing detailed investigation of what is intrinsically an extremely faint object. Zheng et al. used multi-band imaging from the Hubble and Spitzer space telescopes to infer a redshift (and thus distance) to the lensed galaxy using the method of photometric redshifts. This method, which is sometimes called the photometric dropout technique, is nicely summarized in this astrobite. In brief, obtaining photometric redshifts relies on the fact that galaxy spectra have characteristic “breaks”; the authors of this paper specifically consider the Lyman α break, which is caused by absorption in the Intergalactic Medium (IGM). Such “breaks” are redshifted by the expansion of the Universe from their rest wavelengths into longer wavelength filters, and how far they’re shifted depends only on the distance to the galaxy. For example, at z > 7, the Lyman break is shifted from the ultraviolet to the near-infrared. The authors used 16 bands of Hubble photometry (from 0.2-1.6 μm) and 2 bands of Spitzer photometry (3.6 and 4.5 μm) along with a set of galaxy models to constrain where these breaks occurred in their galaxy’s spectrum (see the Figure below). More specifically, they utilized two separate photometric redshift techniques: Le Phare (LPZ; available here) and Bayesian Photometric Redshifts (BPZ; see this paper), each of which compares models of galaxies of various ages and types (e.g. spiral) to the data and predicts a “most likely” redshift. In both cases, the best-fit redshift is about z=9.6±0.2 (corresponding to a cosmic age of only 490 Myr), with the uncertainty reflecting the 68% confidence interval. 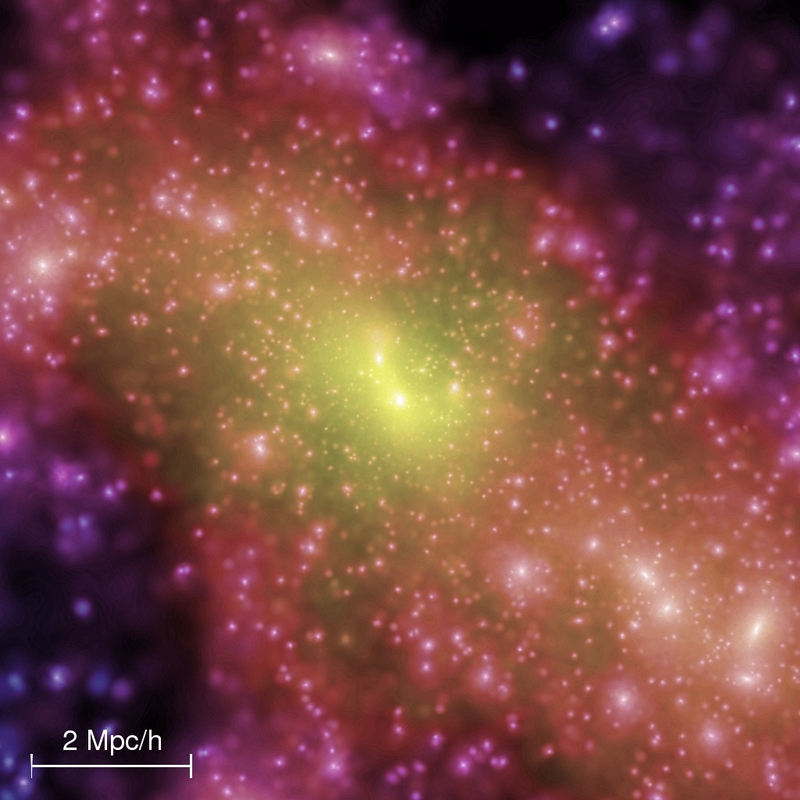 Furthermore, the Bayesian analysis provides an estimate of the stellar mass and star formation rates, and the results suggest that the galaxy is likely in a starburst phase. Hubble and Spitzer photometry of MACS1149-JD1. The blue points are detections, and the green triangles upper limits. 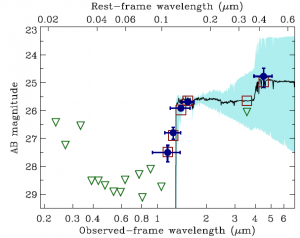 The black line is the best-fit model for a z~9.6 starburst galaxy; the light blue shows other statistically acceptable models. Note the Lyman α break has been shifted to between 1 and 2 microns (Figure 4 from the paper). Zheng et al. consider intermediate redshift solutions as well, but find that they are much less consistent with the data. They also take pains to eliminate several other alternative explanations, ruling out that the galaxy is highly reddened due to scattered light coming from the overall background of faint galaxies, and also confirming that the galaxy is not a solar system object. However, since they used statistical arguments to infer the best-fit redshift, the authors stop short of claiming that MACS1149-JD1 is a galaxy with 100% certainty. If this result were to be confirmed, MACS1149-JD1 would be by far the most distant galaxy ever observed. Just the fact that a galaxy existed at such an early time in the Universe by itself places constraints on cosmology; characterizing it through spectroscopy – which, thanks to the lensing cluster, could be possible with the upcoming James Webb Space Telescope – has the potential to finally provide some data to constrain the theories of the first stars and galaxies. Just a tiny correction, the last name of the first author of this paper is Zheng, nor Zhang. Thanks for alerting me, and my apologies to the author. The misprint has been fixed.